Collaborating with Ed Hamilton on lithographs has been such a great experience. When I was first asked by Ed Ruscha to do prints with Ed Hamilton, I thought we would work on etchings. I went to meet Ed Hamilton and said, "Ed, I am really excited about doing etchings with you!". He said, "we do lithography here". I said, "I am really excited to work on some lithographs with you!". :-) I do love etching, but Ed made it possible for me to experiment and try to get some etching into some of the many lithographs we did together, by scratching into the plates I had drawn into. I do love lithography now as well. What a great printmaker he is! Steven Steinman’s layered paintings combine movement and texture as well as light and shadow. They seek to reveal unseen rhythms and patterns found in nature and open up the picture plain for new ways of seeing. Inspired by such manifold cultural landscapes as firework depictions of the 18th century, Japanese landscape prints of the 19th century to Cy Twombly’s emotional écriture in the 20th century, Steinman’s painting series Sparks & Showers (2016) explores emotional landscapes in vibrantly radiating colors. Steinman was born in Los Angeles, CA, in 1951. He received a BFA from California State University, Northridge, and learned on the job as assistant for Joe Goode and Ed Ruscha. He has exhibited in the U.S. and Europe since the 1980s and his work is included in the permanent collections of the Hammer Museum, San Diego Museum of Art, Fogg Art Museum at Harvard University, Yale University Art Gallery, National Gallery of Art in Washington D.C., Albertina in Vienna, Austria, Kunsthaus Zurich, Switzerland. Berlin is full of history and historical traces. The first time I came to Berlin I was astounded and shocked about all the bullet-holes you still could see on many buildings and façades. They made the memory of the war past and present at the same time. Now that Berlin has gone and is still going through a phase of renovation and reconstruction, these holes are slowly but surely disappearing. With “Shroud of Berlin” I want to do an imprint of that impression and the time/memory caught in it. MINUS SPACE is delighted to present the survey exhibition Julian Pretto Gallery. Organized in collaboration with artist John Zinsser, this is the first exhibition to examine the history and legacy of gallerist Julian Pretto (1945-1995) and his fabled downtown New York galleries, active during the mid-1970s through the mid-1990s. Renowned for his sophisticated eye, keen ability to recognize new talent, and uncommon generosity, Pretto was beloved by the artists he exhibited and widely-respected in the greater contemporary art world. During his 30-year career, Pretto presented the work of well over 100 artists spanning multiple generations, strategies, and styles at an array of small, often temporary alternative gallery spaces in Manhattan’s Tribeca, Soho, and West Village neighborhoods. With a penchant for reductive abstraction, he worked both with established artists closely associated with the Minimalism, Post-Minimalism, and Conceptual Art movements, as well as emerging artists investigating new forms of hard-edge, monochrome, pattern, and gestural abstraction. Julian Pretto Gallery will highlight a single work by more than 40 national and international artists. On view will be work in an array of different media, including painting, drawing, sculpture, installation, video, and poetry. All works included in the exhibition were either exhibited at Pretto’s gallery, produced at approximately the same time of those exhibitions, or acquired directly from Pretto. By no means an exhaustive survey, each of the artists included in this exhibition participated in multiple solo and group exhibitions with Pretto over the years. Many are also represented in the Julian Pretto Collection at the Wadsworth Atheneum Museum of Art in Hartford, CT.
Leonard Julian Pretto was born in Chicago in 1945 and raised in Ogelsby, IL. His father owned a company that produced television cabinets. Pretto studied at the University of Illinois where he met long-time friend and collaborator, Chicago gallerist Roger Ramsay. 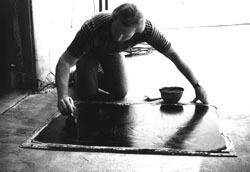 In 1968, Pretto began to work as an assistant at Richard Gray Gallery in Chicago. After a brief marriage that ended in divorce, Pretto moved to New York later that year where he worked for Richard L. Feigen Gallery. In 1972, Pretto changed his name from Leonard to Julian Pretto. With a genuine instinct for the nexus of underutilized real estate and innovative visual art, Pretto began to locate empty storefronts and other available spaces throughout lower Manhattan, in particular in the Soho and Tribeca neighborhoods. Through a personal contact at the NYC Department of Buildings, Pretto began to contact property owners offering to help develop and raise the profile of their properties by organizing temporary exhibitions in them. Pretto continued this strategy over the next two decades and pioneered the concept of pop-up galleries. In 1974, Pretto organized his first documented exhibition at 247 W. 30th Street, 15th Floor. He began to work for Sperone Westwater Fischer in 1975 as the first director of its new NYC gallery. In spring 1976, Pretto began to organize what would later be known as the Fine Arts Building at 105 Hudson Street in Tribeca. Pretto converted the former empty 10-story office building into one of the key cultural hubs in this new, emerging arts neighborhood. The building housed dozens of artist studios, as well as several new galleries, exhibition spaces and non-profits. This included the groundbreaking organizations New Museum of Contemporary Art, Printed Matter, and Artists Space, among others. Pretto opened his first eponymous gallery on one of the lower floors of the building before later converting the adjacent building at 176 Franklin Street, a former speakeasy, into a 3-story gallery. Exhibition highlights during this period included a three-venue career survey of Rosemarie Castoro, the first exhibition of Allan McCollum’s Surrogate Paintings, and an large-scale exhibition of Lucio Pozzi mounted in collaboration with Hal Bromm Gallery and John Weber Gallery. From the inception of his program, Pretto invited emerging curators and future dealers to organize exhibitions at his gallery. Jeffrey Deitch curated his first exhibition Lives at the gallery in December 1975, which presented artists who used life as their art medium and included Vito Acconci, Laurie Anderson, Joseph Beuys, Jonathan Borofsky, Scott Burton, Dennis Oppenheim, Andy Warhol, William Wegman, and Hannah Wilke. Other curatorial projects at the gallery included Painting organized by Annina Nosei (1975), New Sculpture Plans and Projects organized by Rosalind Krauss (1976), and Aspects of Minimal Art organized by Per Jensen and Naomi Spector (1978), among others. In the early 1980s, Pretto moved to Costa Rica where he was involved in the local contemporary art scene. He purchased a modest house situated underneath a volcano in the town of Fortuna and began to organize exhibitions of local and international artists both there and in the capital San Jose. In 1985, Pretto curated the group exhibition Contemporary Costa Rica at The Clocktower in NYC. In 1987, Pretto moved back to NYC permanently. From 1987-1993, he opened a series of primarily smaller gallery spaces on the western edge of Soho, including at 103 Sullivan Street, 50 and 54 MacDougal, 251 6th Avenue, 69 Wooster, and 142 Greene Street. During this period of time, Pretto operated at least three different gallery spaces simultaneously. Living quite modestly in the back office of one of his galleries, Pretto organized countless solo and group exhibitions, which were often produced in rapid-fire succession, sometimes lasting no more than two weeks in length. Pretto also formed a brief partnership during this time with Susan Berland and Patricia Hall to create Julian Pretto / Berland Hall Gallery. According to the artists he exhibited, Pretto was the first person they knew to own a cell phone, which he used to communicate between his various locations. During the late 1980s and early 1990s Pretto mounted the first solo exhibitions of then emerging artists Rene Pierre Allain, Julian Lethbridge, Daniel Levine, Cary Smith, Li Trincere, and John Zinsser, among many others. Swept up by the AIDS epidemic and with his health failing, Pretto closed the last of his galleries in 1993, but continued to curate a pair of group exhibitions the following year at Littlejohn/Sternau Gallery and Littlejohn Contemporary, NYC. After a brief period living at The Hotel Chelsea, Pretto succumbed to AIDS-related complications on May 22, 1995, at St. Vincent’s Hospital, NYC. He was 50 years old. His obituary appeared in The New York Times on May 24 and in the Chicago Tribune on June 4. Just prior to his death, Pretto, an individual with few personal possessions, arranged to donate his art collection, consisting of more than 40 works, to the Wadsworth Atheneum Museum of Art in Hartford, CT. In January 1996, the Wadsworth Atheneum mounted the exhibition Acquiring Art in the 90s: The Julian Pretto Collection, which was curated by Andrea Miller-Keller and James Rondeau. In this 1994 work by Steven Steinman, a lush gray field is complicated by the addition of rhythmic skeins of lines. The composition at first seems relatively simple in both form and and means: a gestural use of graphite animates the surface of a paper ground colored gray. Yet it is the extent to which Steinman expertly varies the force of his lines, and the juxtaposition of pencil and powdered graphite, that give the work a surprising formal range. The powdered pigment seems to have been dabbed on in wide, circular strokes. As a result, glimpses of ground punctuate the composition at semi regular intervals. The impression is one of translucent gray veils swaying and parting in the background. The relative density of the gray ground contrasts with the calligraphy that seems to have been rapidly drawn, a tension that contributes to a greater sense of movement at the surface of the work. A generalized pattern emerges from a combination of long vertical strokes, sometimes forming V's and wide arcs. The looming filaments in particular echo the subtle rhythms suggested by the colored field on which they are laid. A sense of both depth and movement invites the viewer into a virtual space.